Pacific Gas and Electric Company and Efficient Drivetrains Incorporated (EDI) unveiled the utility industry’s first plug-in electric hybrid (PHEV) Class 6 truck featuring technology that has the potential to fundamentally change how the utility manages planned and unplanned outages. The vehicle, developed by EDI in partnership with PG&E, features a plug-in electric hybrid (PHEV) drivetrain that combines up to 50 miles of all-electric driving with 300 more miles of driving range in hybrid mode. The result is a Class 6 truck that reduces emissions by 80 percent compared to conventional vehicles. What makes the unit revolutionary, however, is its exportable power capacity of up to 160kW. By harnessing the power of the on-board batteries, this vehicle can power up to 125 homes, potentially eliminating planned outages while shortening unplanned outages. ‘These cutting-edge trucks not only will help us reduce our fuel costs as well as our carbon footprint, but in the event of an outage, we would be able use their exportable power capacity to supply electricity to homes and businesses. Being able partner with a company that operates a manufacturing plant in the heart of our service area will also help us meet our goal of creating economic vitality in the communities we are privileged to serve,’ said Dave Meisel, senior director of transportation and aviation services for PG&E. 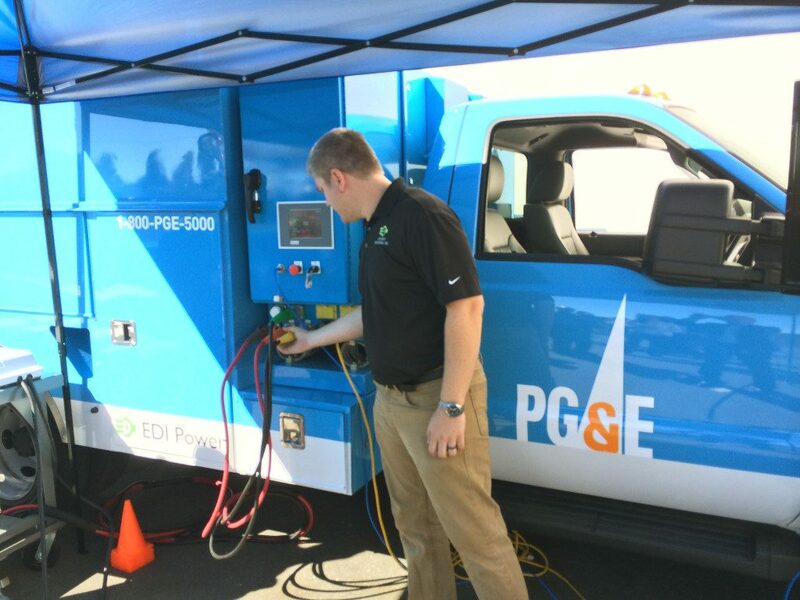 Based in Dixon, California, EDI has partnered with PG&E on technology in the past, including the successful development and implementation of two different class 5 PHEV truck models in 2014. This new vehicle is designed to offer 25% more exportable power capacity than its predecessors while maintaining the same electric driving range on a larger platform truck. All of the EDI units offer both parallel and series hybrid modes, allowing the vehicle to maximize fuel efficiency in both highway and in-city driving conditions. The truck, a flat-bed design, will be used to haul materials such as transformers to job sites. PG&E has accepted delivery of two of the units. PG&E operates nearly 3,500 alternative fuel vehicles, including approximately 1,000 electric and electric hybrid units, saving them fuel, money and the environment. EDI was founded in 2006 and began operation in 2007 with a small government loan from the State of California. Since that time, they’ve grown into a multi-million dollar company, commercializing hybrid and electric drivetrain solutions, continuously variable transmissions, and drivetrain software for automotive manufacturers worldwide. In addition to their US presence, EDI exports electric vehicles to China, and attracts foreign investment from China to support local jobs. EDI has operations in Dixon, California and worldwide headquarters in the Silicon Valley.